Here are two recipes for Valentine’s Day treats by cookbook author and QVC’s resident foodie David Venable. tDavid’s insider tip: Never seen edible gold leaf? For an extra-special touch, it makes a great addition to a homemade dessert. Look for edible gold leaf at craft stores or gourmet food markets, but take great care when handling the flakes because they’re very delicate. Place the chopped semisweet chocolate in a medium-size bowl and set it aside. Combine the heavy cream and sugar in a saucepan and bring the mixture to a boil over medium-high heat, stirring occasionally. Immediately pour the hot cream mixture over the chopped chocolate. Let it sit for 1 minute, then gently whisk until the chocolate is melted. (The mixture will be slightly thick.) Pour the Champagne into the chocolate mixture and whisk gently until the Champagne is incorporated. Cover the chocolate mixture with plastic wrap and refrigerate for 4-5 hours or overnight. Using a small ice cream scoop, spoon the chilled mixture onto a baking sheet lined with parchment paper. Then refrigerate it. Place all but 1/2 cup of the chocolate chips into a heat-safe bowl. Then set it aside. Bring a few cups of water to a boil in a medium-size sauce pot. Turn off the heat and place the bowl with the chocolate chips on top of the sauce pot. Let it sit for 3-5 minutes. Lightly whisk the chocolate chips until they’re fully melted. Remove the bowl from the sauce pot, add the reserved 1/2 cup of chocolate chips and whisk until they’re completely melted. Dip the truffles in the melted chocolate (a dipping fork really comes in handy here) and place them on a baking sheet lined with parchment paper. Let the truffles sit until the chocolate has completely hardened. If desired, use a small, dry paintbrush to brush edible gold leaf on top of each truffle. tDavid’s insider tip: You can skip a step in this recipe by using crunchy peanut butter and omitting the chopped peanuts. You’ll get the same great crunch! Line 2 cookie sheets with parchment paper and set them aside. Cream the peanut butter, margarine and vanilla extract in the bowl of a stand mixer that’s been fitted with a paddle attachment. Add the powdered sugar to the peanut butter mixture in 3 steps, mixing well after each addition. Next, add the peanuts and mix until they’re evenly distributed. Using an ice cream scooper, scoop the dough to form 1-inch balls. Place the balls onto the prepared cookie sheets and insert a toothpick into the middle of each ball. Place the cookie sheets in the freezer for 1-2 hours. While the peanut balls are freezing, melt the chocolate chips on top of a double boiler. Remove the balls from the freezer and then dip each one into the melted chocolate, leaving a small area on top to resemble a buckeye. Let the balls cool until the chocolate has hardened. Remove the toothpick and gently smooth the peanut butter mixture to cover the holes. 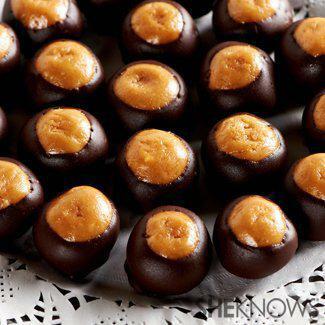 Store the finished buckeyes in the refrigerator or freezer.